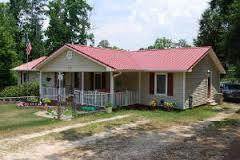 Professional Metal Roofing installation in Louisburg North Carolina. Hopefully, you won’t have to Replace your roof more than one or two times in a lifetime, with a new metal roof installed by Competitive Edge in Louisburgg North Carolina, we can pretty much guarantee you will never have to worry about it again because all metal we install comes with a 40 year warranty, as well as a 5 year guarantee on all of our work! Louisburg NC Installation Of: Galvanized, Copper, and Painted Metal Rib Roofing. With a standard 40 year warranty, and our guarantee on all of our work, we can almost guarantee you will never have to replace your Metal Roof in Louisburg North Carolina again! You just cannot calculate the pricelessness of a beautiful new metal roof by Competitive Edge Roof installation experts. With many roofs lasting well over the 40 year warranty period lasting 2 to 4 times the life-span of asphalt shingles! Metal is one of the most reliable, durable, and efficient roofing materials offered today, our experts install Metal throughout North Carolina including areas such as Raleigh-Durham, Mebane, Cary, Holly Springs, Roxboro, Oxford, Louisburg, Butner, Haw River, Graham, Sanford and all surrounding areas. After we have installed your beautiful new Metal Roof you will instantly notice a drop in your utility costs! In addition to lowering your Utility costs, it could potentially lower your homeowners insurance depending on who you have your policy with, Reduce your heating and cooling costs, Lasts two to three times longer as a Roof that is not installed with Metal By Competitive Edge Metal Roofing. Most Metal Roofs can typically pay for theirselves within 10-15 years easily! Looks Great to improve the quality of your home! and adds value for re-sale! Contact Competitive Edge Metal Roofing today to setup your free estimate in Louisburg, NC or any surrounding area and take the first steps to significantly improving your most cherished investment, Your Home! Competitive Edge Metal Roofing Co.